Today is the first anniversary of my blog going live. It didn’t actually go live to the world on March 24, 2013–I don’t think I told anyone about it until April but my first post and my first review went up a year ago. I know, it’s terribly exciting. It seemed important to mark this momentous occasion in an appropriate manner, and so here is a review of the Bowmore 12. As my first review was of the Bowmore Legend you can see that this is an allegory for the remarkable rise in the status of my blog in the last year. By my second anniversary I expect to have tens of readers and will celebrate accordingly with a review of the Bowmore 15, Darkest. But all this sentiment is making my fingers quiver on the keyboard, so let’s get right to it. The Bowmore 12 is not Bowmore’s entry level malt (that would be the aforementioned, somewhat nondescript Legend) but it is nonetheless their counterpart to the Laphroaig 10, Ardbeg 10 and Caol Ila 12 in the field of young peated Islays (I’m not counting the Lagavulin 16 here given its higher asking price). It doesn’t quite get the respect of those malts though. A large part of this stems, doubtless, from the knee-jerk anti-Bowmore sentiment that continues to linger in the minds of many geeks; it is also true that, as with almost everything from the distillery, the Bowmore 12 is least like its peers. And not just because it’s the only one that comes in a clear bottle; it’s also less peated and more floral. It’s certainly not the Islay malt with which to signal your love of extreme whiskies. I quite like it though and always suggest that newcomers begin their introduction to Islay with one of the aforementioned trio and this 12 yo so as to not get locked into one particular view of Islay peat. And if you are new to Islay this will give you enough of a sense of the Bowmore’s profile to be able to tell if you want to go further (and this is probably the distillery whose profile is most consistent from official to independent bottlings). It’s been a staple on my shelves for a long time–even as my collection of esoteric indie releases has grown–and I’m glad I’ve finally gotten around to reviewing it. Nose: Sweet peat, some coal smoke/sootiness and coastal notes–sea shells, some salt–mixed in with very light notes of lavender and passionfruit and over-ripe peach (not unlike in some Darjeeling teas). Gets sweeter and fruitier as it sits and there are some darker notes too now–raisins, brown sugar. Palate: Much more smoke here (ashy smoke) and a lightly bitter edge that holds the sweeter notes from the nose in check, but otherwise it’s pretty much as on the nose though far less concentrated. Rather thin on the texture front too. After some time that lightly bitter edge turns more unpleasant and acrid. Finish: Not very long–the smoke peters out leaving the impression of having licked a not very heavily used ashtray. As time goes on, however, more and more ashy smoke clings to the palate. With more time the salt hangs around longer too and brings some of the fruit with it. This entry was posted in -Whisky by Rating, 80-84 points, Bowmore. Bookmark the permalink. Bowmore really could be so much more than what it currently is. They make good whisky, but mostly either put out watered down, lackluster bottles (Legend, Small Batch, etc) or super-expensive limited editions (Devil’s Cask, etc). It would be nice if they would refocus the brand, pare down their offerings a bit, and give their core range (12, 15, 18) craft presentation. Tempest was a good start, but it was downright insulting to release the same thing with a different name and a bigger price tag over here. The Tempest was renamed the Dorus Mor after the first release on account of a trademark lawsuit–from a California winery, I think. And I think the first release as Dorus Mor was at the same price as the Tempest–haven’t tracked it since then. I do agree that they should up the abv on the 12. It should be noted though that even the Laphroaig 10 is at 40% in the UK and that version is far inferior to the 43% version we get in the US. I do respect that they put out whisky at a lot of price points–as Glenlivet does as well. There’s a Bowmore for every budget, it seems like, and so far at least they haven’t jacked the price of their 18 yo up obscenely. I don’t mind the name change, just the price difference. Before shipping, Bowmore Tempest is ~$60 in the UK, versus $100 for Dorus Mor here in the US. The former is a totally reasonable price. The latter, much like the Devil’s Cask release, seems absurd to me for what are relatively young cask strength whiskies from a big, established company. If you’re not counting shipping then you have to look at the price including v.a.t. It’s still lower though: $80 vs. $100 incl. tax here–but that seems like it can mostly be attributed to the three-tier markup here. On the other hand, the Bowmore 12 is £29.95 in the UK, and in Minnesota you can get it for $32.99. So they seem to be discounting their entry-level malt for people on budgets and subsidizing that with more expensive stuff for hobbyists. I can accept that. 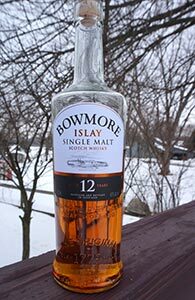 For a (slightly) dissenting opinion on Bowmore 12yo read on. I’m far from a Bowmore hater, this is a top 5 distillery for me. I just don’t like their focus on sweet, sherried bottles, given how great ex-bourbon Bowmore is (especially at cask strength). It’s a formula that sells, for sure, the same one used by Lagavulin 16yo and JW Black 12yo. It’s also true that among these three I prefer the Bowmore, having the most prominent and interesting taste profile. It seems that I gave this bottle 3.5/5 stars, which is in fact a high score, consistent with yours. I like how you started out dissenting and ended up agreeing with my assessment. If only everyone would be so reasonable. Yes, I was surprised myself. My 3.5* score was too high, that would put it on my list of favorites, and this is not. 3* is more like it, and more in line with your score of 83. It seems that we agree on the overall score, but you like this style whereas I don’t. I knew that. Even so, I must have liked this whisky better than I remember.